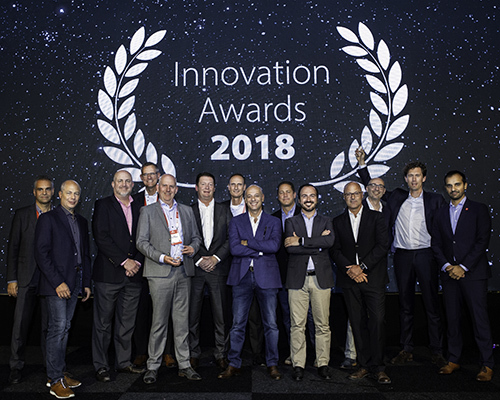 Netherlands / News / Atos wins two Innovation Awards at OutSystems NextStep 2018. Atos wins two Innovation Awards at OutSystems NextStep 2018. During the OutSystems NextStep in Amsterdam, Paulo Rosado, CEO of OutSystems, handed over two 2018 OutSystems Partner of the Year Awards to Atos. The Pioneer Award was received for on-boarding the most new logos during the last 4 quarters. The Rainmaker was given to Atos for being the partner who realized the highest revenue for OutSystems. Both are seen as major achievements as Atos has a strategic partnership with OutSystems since 2016. Atos is the fast growing OutSystems partner where Atos counts now 80 certified OutSystems developers and has a mature Center of Excellence to enable customers to on-board the OutSystems platform. During the two-days NextStep event, many customers visited the Atos stand to discuss the enablement of OutSystems to support their digital transformation. Apart from mobile and web application development, Atos focuses on legacy replacement to modernize the current application landscapes. Based on some Atos references, the possibilities and challenges of rebuilding legacy applications were discussed. In the panel discussion “From CEO to Sprints”, Kees Kranenburg, solution lead Low-code Platforms at Atos, gave insight into the process of decision making, knowledge capture and ramping-up OutSytems capabilities. When you want to hear more about how Atos can help you with legacy replacement, please contact Kees Kranenburg.